Israel, Lee. Kilgallen: A Biography of Dorothy Kilgallen. Hyman, B.D. My Mother's Keeper. Martin, Steve. Born Standing Up: A Comic's Life. Maclaine, Shirley. Don't Fall Off the Mountain. 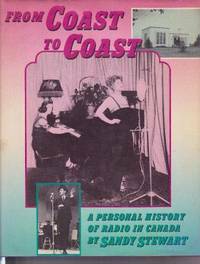 From Amusing Ourselves To Death to The Art Of Plain Talk, from	Pony Express- the Great Gamble to Long Row Of Candles Memoirs & Diaries, we can help you find the media & communication books you are looking for. As the world's largest independent marketplace for new, used and rare books, you always get the best in service and value when you buy from Biblio.co.nz, and all of your purchases are backed by our return guarantee. Originally published in 1985, Neil Postmans groundbreaking polemic about the corrosive effects of television on our politics and public discourse has been hailed as a twenty-first-century book published in the twentieth century. Now, with television joined by more sophisticated electronic mediafrom the Internet to cell phones to DVDsit has taken on even greater significance. 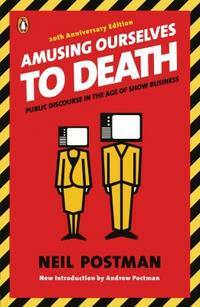 Amusing Ourselves to Death is a prophetic look at what happens when politics, journalism, education, and even religion become subject to the demands of entertainment. It is also a blueprint for regaining controlof our media, so that they can serve our highest goals. TIM RUSSERT is NBC-TV's senior vice-president and Washington Bureau Chief, the producer and moderator of Meet the Press , contributing political analyst for The Today Show , and host of his own weekly news program on MSNBC. He holds the Walter Cronkite Award for journalism and the American Legion Journalism Award. He lives in Washington, D.C. with his wife, writer Maureen Orth, and their son, Like, and was named "Dream Dad of the Year" by Parents magazine. Includes bibliographical references (p. 540-559) and index. Includes bibliographical references (p. 381-407) and index. Includes bibliographical references (p. 469-482) and index. 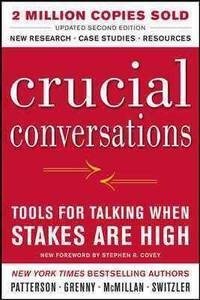 Crucial Conversations: Tools for Talking When Stakes are High is a book by Kerry Patterson, Joseph Grenny, Ron McMillan and Al Switzler. 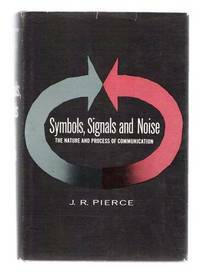 The book discusses how to handle disagreements and high-stakes communication. It was first published by McGraw-Hill in 2002 and has since become a New York Times bestseller.